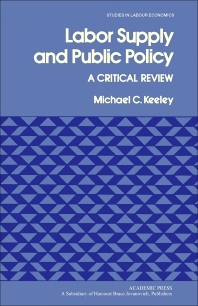 Labor Supply and Public Policy: A Critical Review deals with the theoretical and empirical econometric research done on the determinants of labor supply and with the effects of public policies on labor supply. This book reviews the various estimates made from studies concerning the economics of labor supply and evaluates the econometric methods that these studies have used. This text also analyzes the labor-supply phenomena, the costs of the different public programs, as well as, the implications of the empirical findings of these studies. The emphasis is on empirical research: many policies that are made depend on the scale of changes in the wage rates and non-market (household) income on hours of work. This book also focuses more on the determinants of the allocation of time between the market and household sectors. The text notes that by using the means of the estimates in the different studies under review, the labor-supply response to public policies involving net wages or income, shows a substantial (but not overwhelming) reaction. This book then correlates this finding with the tax and transfer programs, such as food stamps, unemployment insurance, AFDC (aid to families with dependent children), and NIT (negative income tax). This book is suitable for economists, social workers, and policy makers who are involved in social services, community development, welfare, taxation, labor, and employment.